Here I am about a year and a half into my gastric sleeve journey and I’ve come to the conclusion that it’s one big balancing act. I feel like I’m a kid playing on a teeter totter by myself. I’m always trying to find that sweet spot on it. There’s a thrill when I’m out of balance, but what I really want is the joy of being in the middle with a sense of control. I will admit I am more confident having my picture taken now that I’m 100+ pounds lighter. 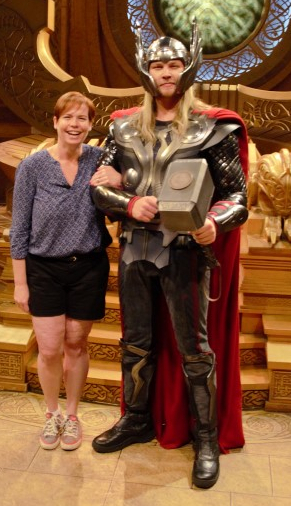 While we did take a family photo with Thor at Disneyland, I wanted one alone with him. Who wouldn’t? What am I trying to balance these days? In the beginning of my journey, it was relatively easy to keep balanced with my success and failure. With the weight coming off quickly, I was motivated and excited. People noticed and complimented me regularly. My body, my mental state and my spirit were constantly changing. Although the journey was difficult and at times I stalled or doubted my abilities, I was always changing for the better. Now that I’ve maintained the same weight for six weeks, I’m happy and disappointed. I’m still about nine pounds away from my initial goal weight. I feel sad, but I also feel healthy and strong at this weight. I’ve gone from a size twenty-two to a size ten so I really can’t complain…but I really want to be size eight. I can run faster than ever, but I still do a combination of running and walking. I am in the best shape of my life, but some days all I see is flab and stretch marks. So I find myself balancing success and disappointment. I wonder, though, wouldn’t it be OK to just learn to enjoy where I am right now in my journey. Isn’t it all right to be happy with what I’ve done so far? Isn’t it enough? Perhaps it is enough, but I worry that thinking that way will make me complacent in maintaining my health. Because that’s my usual modus operandi. I’ve achieved weight loss goals many, many times in my life…for a short time. In the past, my success was always short-lived as I let any type of real or perceived crisis, depression or even happy events like my pregnancies disrupt my healthy path. The weight would always come back as I would just give up until the next time. The cycle always continued. I am terrified of this happening again. But I’m also exhausted of stressing about my weight. How do I balance this fear with the joy of being a continually healthy person? My first plan of attack is to add new goals that will help maintain my weight loss. I really enjoy running 5K races so my new goal is to run a 10K race in April. I hope this new goal will inspire me to keep up my running program and add in other exercise like yoga to keep fit. I also think making reasonable goals is important. Jumping from 5K races to marathons would be foolish on my many levels, but mostly it would be setting myself up for disappointment and failure. An important part of my continuing success is setting new, realistic goals. Losing so much weight so quickly was amazing and made me feel very powerful. The new achievements I reach for aren’t going to be quite dramatic and I need to be OK with that. I also need to find a sense of accomplishment and success outside my weight loss journey. Just as I learned I could be and needed to think of myself as more than a mother and a wife, I need to learn that I’m more than just a person who lost 100+ pounds. I’m still working on this. I hope that writing will give me the sense of power and pride and perhaps even become a career. I’m sure I can find many other goals. It’s time for me to try, isn’t it? It’s back to the teeter totter I go. Learning to be proud and content with my success and learning to strive for new goals is my new balancing act this year. Although I’m not going “down the scale” literally any more, I know that I have much more to accomplish in my life.